All that glitters is a universally flattering colour that I think would flatter pretty much everyone. The peachy colour opens and brightens your eyes making them look bigger. 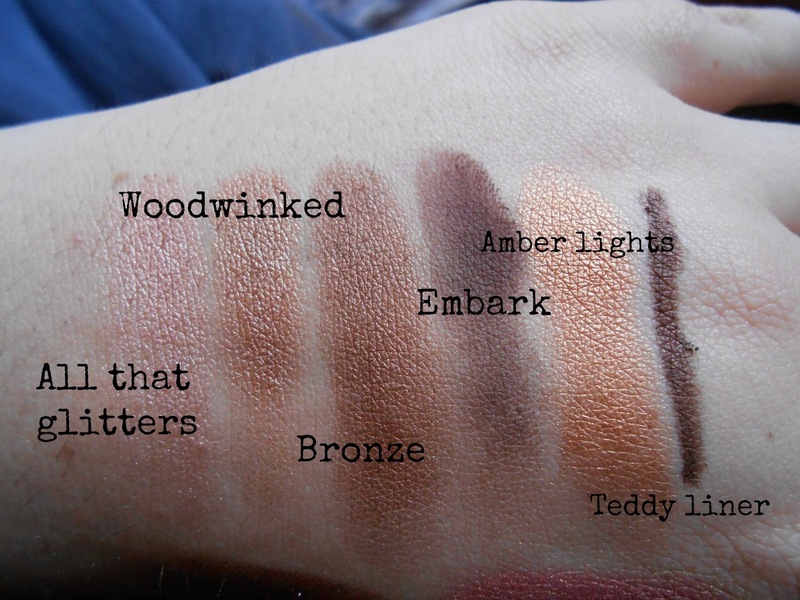 You can easily wear just this shadow blended all over the lid. This doesn’t just make blue eyes stand out, it works with any eye colour! Woodwinked is a shadow that I’ve mentioned so many times, and I still love it. It’s amazing for blue eyes and people have asked me if I’m wearing blue contacts when I wear this shadow. It is quite orange toned so it’s not everyone’s favourite but I’d definitely try it if you have blue eyes! Bronze is another colour that would look good on most eye colours, but the bronze tones really help to bring out the blue. This is a deeper colour so works well in the crease as well. Embark is a matte, and so definitely works well in the crease to add definition. This was recommended to me by my friend Hayley (she’s a MAC girl!) and it’s a deep warm brown with red tones. Amber lights is a stunning amber and orangey gold colour. This one is more dramatic, but the effect is stunning. Teddy eyeliner is the perfect eyeliner for blue eyes! It’s a deep, warm brown with bronze. So much more flattering than black, but just as dramatic. Tempting eyeshadow is one of my first ever MAC shadows and I still love it. The finish is lustre so it’s more glittery which means more fall out. The colour is worth it though, it’s beautiful. On the eyes it looks more golden than in the swatch. Lastly, Expensive pink is a creamy rose gold kind of colour that is just gorgeous. This looks especially good with Tempting, as the colours look like a beautiful sunset. 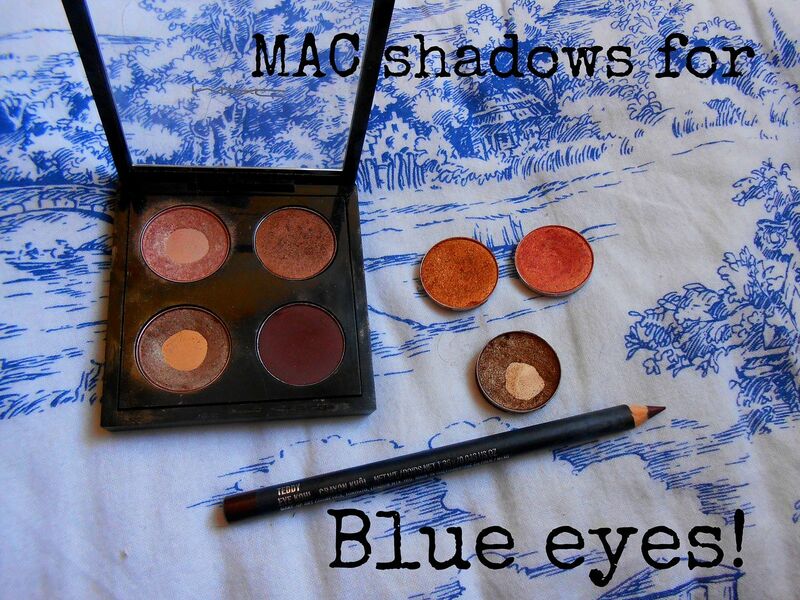 Those are my MAC shadow recommendations for blue eyes! 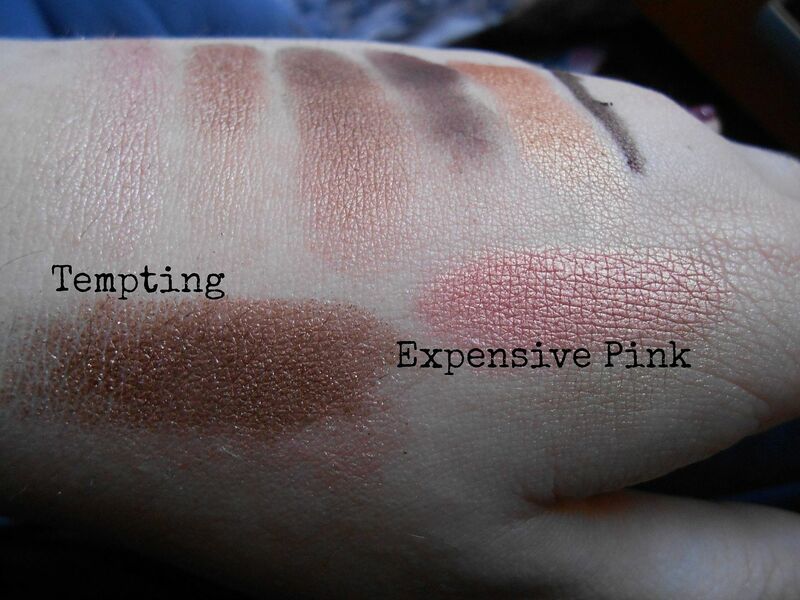 Rimmel Apocalips in Apocaliptic Swatches.